This paper investigates an important connection between the Quattrocento humanists (Pontano, Maio, Decembrio, and Vergerio to mention a few) and Machiavelli. Fifteenth-century humanists tried, often unsuccessfully, to refashion tyrannical, pitiless and opportunistic princes of the Italian courts into virtuous and learned leaders. In an apparently antithetical yet paradoxically similar manner, Machiavelli wrote to Lorenzo di Piero de' Medici in the hope of changing him into a cynical, pragmatic and 'real-politick' leader. 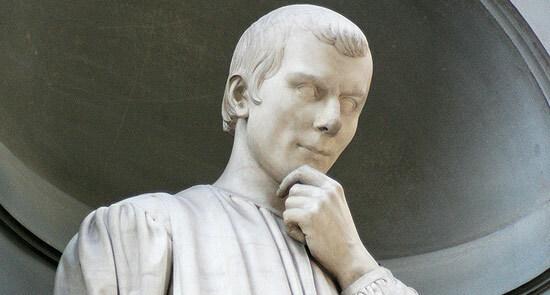 This paper discusses how both Quattrocento humanists and Machiavelli promoted cultural and political values that fundamentally clashed with the reality and nature of the leaderships under which their thought was produced. Andrea Rizzi #machiavelli's "The Prince" did not have a great impact when 1st published ; also mentions recently discovered "arrest warrant"
Rizzi quotes wonderful letter exchange between Vettori and #machiavelli showing origins of "The Prince"
MT @namastenancysf: @3pipenet Printed version not published until 1532, 5 yrs after #Machiavelli's death. Controversial for over 500 years. Dr. Andrea Rizzi holds a BA (Hons) from the Universita' Statale di Pavia (Italy) and PhD in Italian Renaissance from University of Kent at Canterbury (UK). Before coming to the University of Melbourne (2005), he held positions at Kent, University of Western Australia, and University of South Australia. Dr. Rizzi researches and publishes on translation history, Matteo Maria Boiardo, and fifteenth century Venetian chronicles. In lieu of a video, that twitter livefeed was tantalizing. I would love to be able to read the letters between Vettori and Machiavelli.